Check out the links above that reference each grade level and also helpful resources. 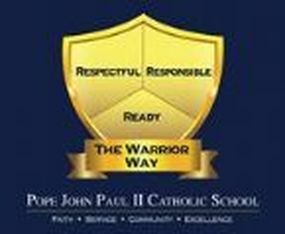 You may click the button below to return to the Pope John Paul II School website. PJP|| students have good manners, share with others, and practices random acts of kindness. We are honest, trustworthy, patient, and show good sportsmanship. We respect school property. We appreciate and honor our teachers, parents, coaches, and fellow students. We respect ourselves and develop high self-esteem through reliable actions. Our appearance is dignified, neat, conservative, and clean. PJP|| School Students recognize the power of prayer and the healing that comes with forgiveness. We witness our faith by giving Sunday to God. PJP|| students demonstrate an awareness of our blessings through our character. We independently make good choices and decisions and we are accountable for our behavior. We take good care of our belongings and clean up after ourselves. We are able to act without guidance or supervision because we are accountable and answerable for our actions. PJP|| School Students lead through example, strive for integrity, and can be trusted and depended upon. PJP|| students come to class prepared, on time, in uniform, and well-rested. We actively participate in class by listening and by being self-disciplined. We, along with our parents, set goals to help us live up to our potential. We take pride in our work both at school and at home. We are well-rounded and balance studies with extra-curricular activities and interests. We give our personal best in all academic subjects and on all school work. PJP|| School Students take personal responsibility for learning.